Comfort first. – Dirty wet dog , boats and sailing. Fifth in the series about starter boats and starting to think about priorities. The reader comment that sparked off this series of posts came after my microcruiser post and in his response the reader said that some of the boats looked comfortable and then said that he was thinking about looking for a boat so maybe comfort is a high priority for him. So far in this series i have talked about making a slightly smarter approach to boat buying than my usual one ie buying something that you can afford and that will work for you. I have talked about budget in a bit more detail and did a quick case study of a few boats at a specific budget. Having said that it’s a good idea to work out what you can afford and what you want out of a boat it is then useful to think again about the essential or desirable features and to place those in order of priority. It might be that performance is a priority and i am going to cover that with regard to small budget boats, today though i am going to take boat comfort as the priority and see how comfortable we can be in a small boat. My own cruising boat is a Hunter Liberty at just over 22 feet and it’s neither a particularly beamy or ‘tall’ boat and yet it is reasonably comfortable for 2 people. Solo i find it really good on comfort (by my standards) although sometimes 2 up we are a bit pushed for space. So what constitutes ‘comfort’ in a boat ? i have sailed and slept aboard small boats that have been perfectly ok and big ones that have been terrible so it’s not nesasarily just a size problem although internal volume can help. Many here will remember the long period when French producers of cruising yachts would claim that their 35 footer had 8 berths !, ok so i have been on racing boats where we slept 7 up on a 1 tonner at that size but it usually meant at least one of us sleeping on (or in) a spinnaker bag. My most comfortable boat ever was my Frances 26 so i thought i might start there and take a look at why that boat worked so well. In terms of the boats that i have been looking at so far the Frances is way outside the budget but i wonder if the same things that make the Frances such a comfortable boat would also be found in some of our budget point boats as well. My first thoughts about the Frances and its amazing comfort are that it’s a much bigger boat than a 23 foot boat in that the extra length makes for a much bigger boat in the middle (usually) and the Frances was a chunky, beamy boat anyway. The second and crucial point is that my Franny was the open plan version so it feels a lot larger because a small space isn’t divided into even smaller spaces by a main bulkhead and heads space. Boats with a bulkhead right at the widest point always feel smaller and especially when the designer also puts a separate heads compartment in as well. With the Frances we each had our own bunk aft and they were comfortable berths and then forward we had that one and a half bunk ‘sprawl’ space where we tended to stretch out during the day with our feet up…..we could both sit with our backs against the hull on opposite sides. In the centre we then had a large working space within which i could just about stand with the boat level and easily when heeled. 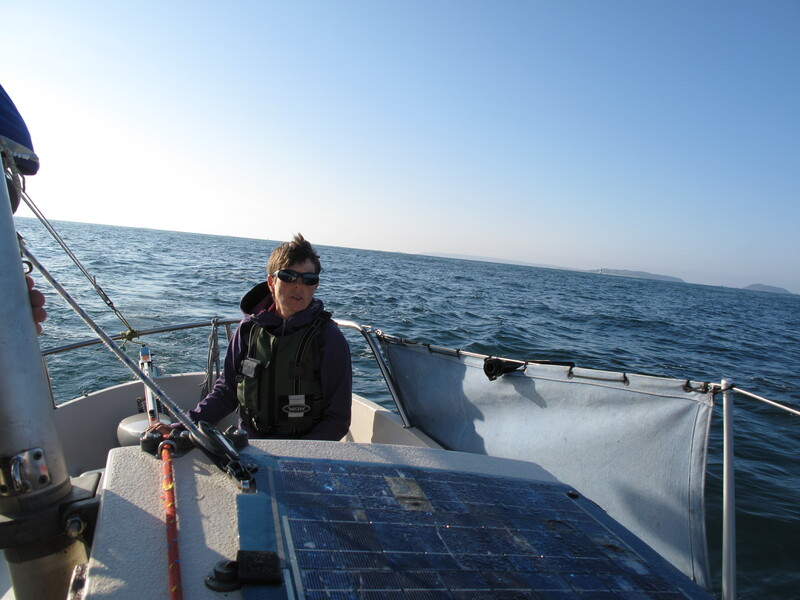 What we didn’t have (and didn’t care) was any form of sea-toilet except a bucket…..quite honestly that never bothered a long term sailor or a farmers daughter !. Some might remember me going to see this boat. (dehler 25) during my search for a slightly larger, faster, more powerful and roomy boat that could also be trailed and beached. Almost as soon as we went aboard we found that nothing about the interior layout and its ‘comfort’ worked for us and this boat is a boxy/beamy IOR style hull that has high volume for its length. In fact both of us found it less comfortable and less functional inside than our 3 foot shorter Liberty. I knew that there would be a keel box and part bulkhead dividing the boat but that should then have given us 2 linear berths in its main cabin and a vee berth up front. The vee berth was so sharp that only my partner could use it comfortably and when she was in the only viable position she had her head directly over that sea-toilet but worse in the main cabin is that i found i couldn’t sit comfortably in either bunk/settee and to use either properly as a bunk required them to be swung into a different position to sleep in. This wasn’t the most uncomfortable boat that i have been aboard, i used to think that description belonged to my leaky Folkboat but even that was vastly more comfortable than the ‘classic’ Deben that i bought as a project. The interior proportions on that were just plain mean and it was a wet cramped space. The only way that i could have made that boat work would have been to strip out and rebuild the interior with just a proper linear berth each side (which is a pretty standard approach) move the galley forward and strip out the forepeak for wet storage and sails only. In fact i began to realise with that boat that maybe the best approach with small boats is to just try and create 2 decent bunk/sitting spaces only and mostly to strip out any semblance of bunks forward because they are hardly ever effective. This linear layout does seem to work though aboard the standard Achilles 24. I didn’t go aboard this particular boat but spent some time aboard one last year trying to work out if the boat would do the job and with this one i found that i was able to sit comfortably along either bunk with cushions up against the low galley bulkheads. The cabin height was very similar to my Liberty ie enough to sit upright which has become for me a crucial defining measurement for comfort. Its strange but with the similar volume of the Contessa 26 that with the same layout i couldn’t get as comfortable doing the same thing. As a boat i have always liked and respected the Contessa for its seagoing qualities but never liked them for their comfort. As with the boat that the design sprang from, the folkboat, they have a long and skinny forepeak that to my mind should almost be an empty space for sail bags and fenders. The last of the first crop of budget-point boats that i looked at is the most quirky in terms of its interior layout…..the Sadler 25 and although i don’t particularly like the way they come as standard its the one that i felt i could get the best from but only if i modified it. This is nothing like the standard linear arrangement that most English boat designers created but goes back a bit to when ‘dinettee’ layouts were popular….the main bunk/settee space to port was designed as a dinette sitting area. The main reason why i thought this boat might work is that the interior volume in the main cabin is very good for the size and i thought fairly easily adaptable. As standard it didn’t work that well but had promise. For that project i was quite inspired by this interior which is i think in the similar sized Waarschip quarter-tonner which i nearly went to take a look at. There is a simple answer here and that is just to get aboard the boat that you like the look of, sit in and lay in the bunks, put your feet up and imagine yourself at anchor , cooking a meal or trying to get some sleep. It will become quickly obvious when the bunks aren’t either long enough or wide enough as with both my Folkboat and the Deben or you can’t work in the given galley area as with my Liberty. The Deben would have needed a complete interior rebuild to make it work but all the Liberty needed was to treat the entire cabin forrad of the centreboard space as one large sprawl-space and relocate the galley to just inside the companionway. Maybe this is an answer too : take the standard boat and be prepared to mess about with it a bit. I got a lot of what i wanted with the standard boat ie enough space for 2 people to sit in reasonable comfort and to bed down together. Nowadays 2 of us can sit in greater comfort because i often sit by the hatch when i am cooking or as below when i am keeping anchor watch…..that was taken when we were sheltering from a westerly gale. With the small modifications that i made we now have a much better sitting and sleeping space and a galley that works. What we lost is that awkward coffin berth which was only ever storage anyway but please, please don’t start me off on the Liberty’s heads compartment !. Previous One, one and one.